If you're after classic heavyweight British tone and iconic styling, the new Rockerverb doesn't disappoint. Excellent build quality - this will last on the road. Just about every classic Orange tone onboard. 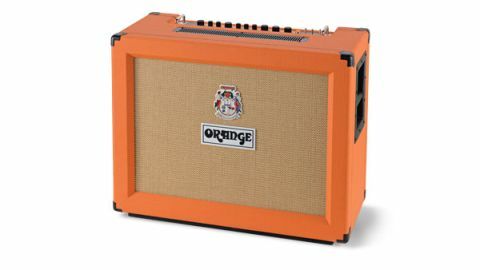 It's been just over 10 years since Orange released the original Rockerverb - the first proper high-gain Orange - and the new MKIII version has a host of improvements intended to keep the range at the top of the tree. There's a redesigned clean channel, a footswitchable attenuator and a new smoother reverb circuit, for starters. The trademark picture frame cabinet, orange vinyl and basket weave grille haven't changed, although there's one small but significant style upgrade: the new control panel is 'pics only', like the classic 'Graphic' amps from the early 1970s. We like this nod to the past; it makes the panel look cleaner, and it's actually easier to navigate. "Make sure your roadies are well fed: not only is it built like a brick outhouse, it weighs the same as one"
There are two separate channels for clean and overdrive. The redesigned clean channel has controls for volume, bass and treble, while the drive channel gets a gain, master volume and a three-band EQ. You also get global controls for reverb and the new built-in attenuator. Another new feature is a three-way standby switch that lets you run the power stage in pentode (full power) or triode (half-power) mode, dropping the output down to around 30 watts. As the MKIII is built to Orange's uncompromising standards, it will easily handle non-stop touring. Just make sure your roadies are well fed: not only is it built like a brick outhouse, it weighs the same as one. The solid steel chassis supports a pair of transformers likely big enough to power a small village. It's these, along with a pair of Celestion Vintage 30 loudspeakers, that make up most of its massive 40kg kerb weight. The Rockerverb's new clean channel has a zingy treble, fat midrange and powerful bass - it's 'chimier' than earlier models, while the drive channel has tons of gain, authentically covering classic 70s sounds with ease, as well as modern rock and metal. Turning the attenuator clockwise reduces output volume at the speakers, letting you push the output stage into soft clip at levels that won't make your ears bleed. Used on the clean channel, this produces a fat, touch-sensitive drive effect that's very similar to the original non-master volume amps, and perfect for blues, especially with a good Les Paul. The retuned reverb is smooth and very effective for ballad solos, as well as being noise-free, even with the level pushed up. Beyond any doubt, the new Rockerverb is a serious pro product, and as you'd expect, the price is pretty serious, too. However, these UK-made amps are built to last, so you're definitely getting your money's worth. Just about every classic Orange tone from the early Graphic amps to the Dark Terror is here, and thanks to clever 20-step detented rotary controls, it's easy to get the same sounds consistently, night after night.